911uk.com - Porsche Forum : View topic - Tyre sizes and types. 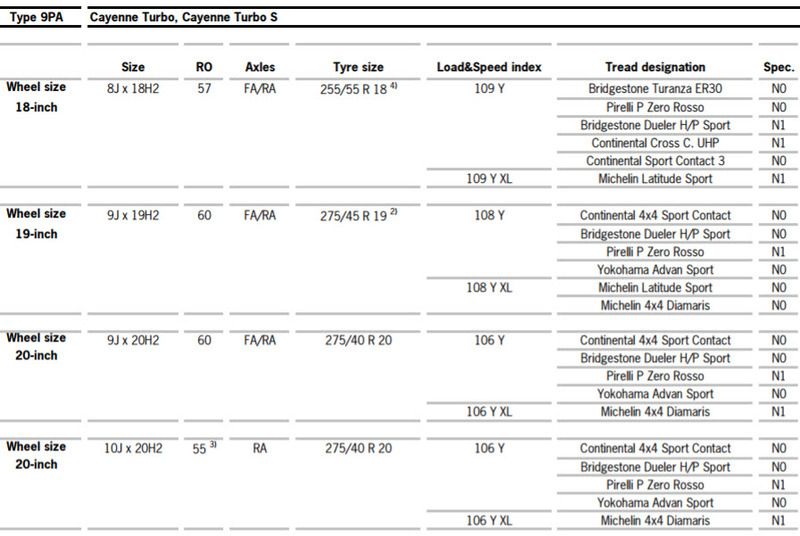 911uk.com Forum Index > Cayenne (2003-) & Panamera (2009-) > Tyre sizes and types. Posted: Mon Dec 11, 2017 10:04 am Post subject: Tyre sizes and types. I'm looking at changing the tyres on my 2003 Cayenne Turbo and have a couple of questions.. It's currently fitted with the budget brands it came with (Accelera on the front and Roadstar on the rear) in 275/40 20. I don't have anything to compare it with, but having budget tyres on a car like this makes me feel like I'm not doing it the justice it deserves. I wouldn't say that I've noticed any problems as such like lack of grip, but I've always thought the ride is quite harsh even in 'comfort' mode. Are Turbos with 20" just like this? Or might tyre make (rather than profile) play a part? Any reason to go for the Michelin over the Avon? Also, I noticed when searching for tyres by registration number, that there seems to be an implication that I should have 275s on the front, but 295s on the rear. Is this so? Perfect answer, thanks very much!